Repetition leads to comfort in the kitchen. Things did not go perfectly when I made this breakfast scramble yesterday morning. Yet, because I had made it about half a dozen times before, I was able to persevere through the challenging moments. Just after I started cooking, the potatoes became glued to the skillet and a sticky film formed over the surface, needing to be scraped off with a spatula to allow the potatoes to move around and cook on all sides. I had added a small amount of safflower oil, and think maybe the oil is what’s causing this sticky substance to form. Next time, I’m going to try this dish with no oil at all and dry fry the potatoes. 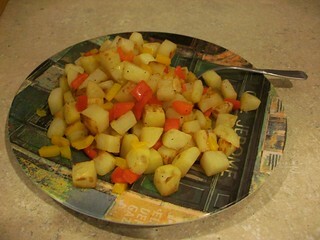 Breakfast Scramble with potatoes and peppers. You can add much more than potatoes to a breakfast scramble if you like. In the past, when able, I’ve enjoyed having it with scrambled eggs and chunks of broccoli, mushroom, bell pepper, and tomato with salt and pepper to taste. Cooking Camp is getting good! I’ve broken free a bit from the fear and intimidation, and am enjoying watching zucchini weep water droplets when they are chopped at the end. As well as learning how to spell it: it has an “h” in it, and all my life I’ve been writing “zuccini.” Last night I used a mortar and pestle to grind up whole coriander seeds that flowered the kitchen with perfume clouding into the scent of chopped onions. I ate a spoonful of plain cooked quinoa and really, really liked it (Ryan did the cooking, partly from habit, partly because we needed to not burn the quinoa and I’m good at that). I’ve been chopping carrots, rainbow shades of bell pepper, potatoes, and sweet potatoes lately. Yesterday I spent a lot of time in the kitchen making the breakfast scramble and later, the quinoa salad for dinner.